Black Mirror is boldly going where other sci-fi shows have gone before, and frankly, we're suspicious. The anthology series, often referred to as a Twilight Zone for the modern era, has never been one to offer up its story premises easily. Every episode unfolds like a puzzle box, full of unpredictable twists and jarring turns. Suffice to say all is probably not as it seems in this exceedingly optimistic teaser for what is perhaps Black Mirror's most anticipated new episode of its upcoming fourth season, "U.S.S. Callister". Following a ship in the powerful and diverse "Spacefleet", the teaser shows Jesse Plemons' Captain Daly welcoming a confused-looking "new member" of their crew. There are shots in outer space and on other worlds, both of which would be new ground for this show, which is often set more "10 seconds into the future" than what looks like a thousand years. It all invites the question—is this really happening? Or it this, as the show has shown before, some sort of simulation? Maybe a TV show, or even video game? Either way, something feels very off on the bridge of the U.S.S. Callister. While the costuming and ship design clearly evokes Star Trek, the flippant and sarcastic crew comes off like they just walked off The Orville, and the unsettlingly optimistic tone of the teaser—unusual for this series—makes it feel more like a slimy and fascist Starship Troopers spinoff than Star Trek XIV: Now Streaming on Netflix. 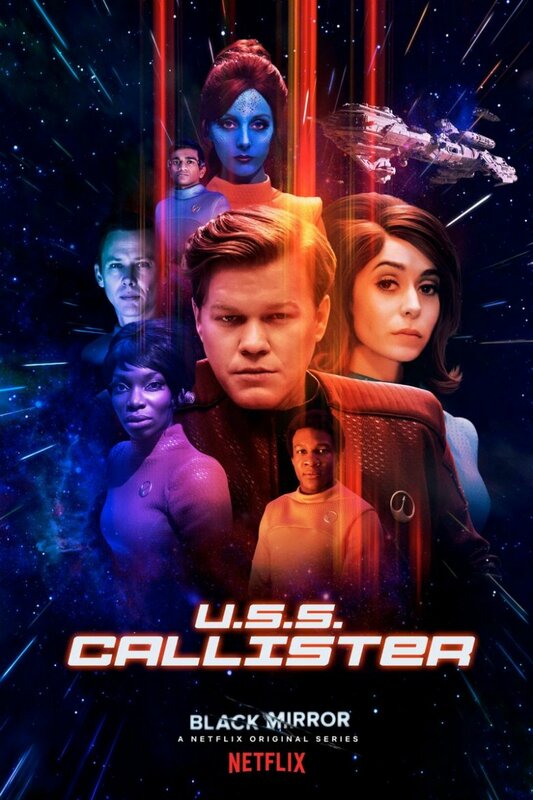 In addition to Plemons, who gets a captain's reception in the teaser and front-and-center billing on the episode's poster, the episode stars Westworld's Jimmi Simpson, How I Met Your Mother's Cristin Milioti, Bridge of Spies' Billy Magnussen and Michaela Coel, who previously appeared in the season three episode "Nosedive", playing—presumably—a different character. Netflix still hasn't announced a release date for the new six episodes of the series, though now that all six episodes of the new season have gotten their own teasers, an announcement of that nature couldn't be too far behind. "U.S.S. Callister" is directed by Toby Haynes with a script by William Bridges and show creator Charlie Brooker. Check out the final frontier-evoking key art for the episode down below.